Kymco Scooters celebrate being Number 1 in 2011 with $100 Free Fuel for each purchase of any Kymco scooter. Do you know how far you can go on 100 bucks worth of fuel? A long way! Offer is valid at participating Sydney dealerships only. The Piaggio Group have just released the overall global picture for 2011 and beyond. In a recent review to shareholders we take a look at some of the key points and sales results by region. The Report also outlines a snapshot of what's instore for the future. In 2011 the Piaggio Group shipped a total of 653,300 vehicles worldwide (up 4.0% from 628,400 in 2010), including 415,000 vehicles in the two-wheeler business (scooters and motorcycles) and 238,300 three and four-wheel commercial vehicles. Looking at performance in the different geographical and business areas, in 2011 the Piaggio Group confirmed its position as European leader in the two-wheeler sector, raising its market share to approximately 20.1%; its market share in scooters improved to approximately 27.6%. 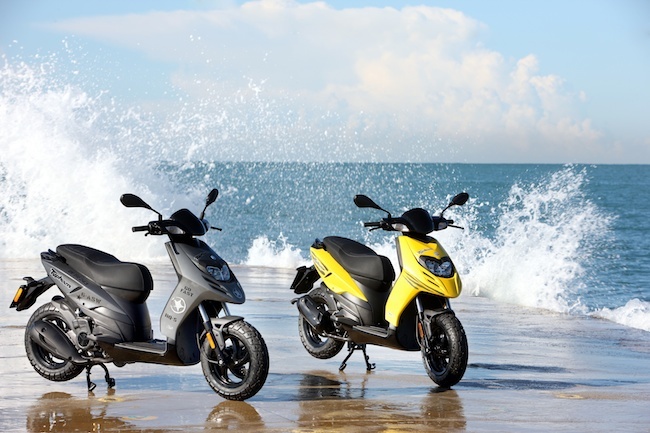 Although the two-wheeler market in the EMEA area showed an overall decline of 9.5% (-11% in scooters and -7% in motorcycles), the Group’s commercial operations in Europe were particularly incisive, so that, with shipments of approximately 300,000 vehicles, the sales slowdown was smaller than the market downturn – leading to an improvement in market share in almost every country – and the revenue decline was contained at 3.5% (2011 turnover 802.5 million euro); this was also thanks to the positive effect on the mix of higher sales of top-end motorbikes, as a result of the success of the latest Moto Guzzi and Aprilia models. On the American scooter market, which showed signs of an upturn in 2011 (with a 6% increase in overall vehicle registrations from 2010), Piaggio Group penetration made significant progress (market share rising from 27.1% to almost 30%), with shipments of 10,300 vehicles (+63.8% from 2010) and revenues of 35.4 million euro (+53.0%). Particularly worthy of note is the extraordinary progress in worldwide sales of Vespa branded vehicles to more than 150,000 scooters shipped in 2011. As a comparison, worldwide Vespa scooter sales in 2003 were approximately 50,000. On the Asian market, 2011 was an extraordinarily positive year for the Group, which reported strong growth compared with 2010, with 104,800 vehicles shipped (+75.9% from 2010) and revenues of 187.5 million euro (+40.8% from 2010). Excluding the exchange-rate effect, revenue growth in this area was 55.1%. 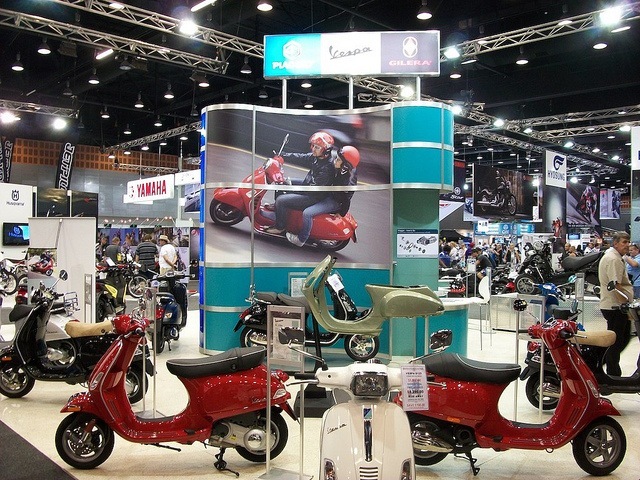 The result reflected the growing success of operations in Vietnam (where marketing began of the Liberty scooter produced in the Vinh Phuc factory, and the milestone of 100,000 Vespa's produced since production began in Vietnam in June 2009 was reached in the second half of 2011) and entry on to important new markets in South East Asia: Indonesia, Thailand, Taiwan and Malaysia. In the commercial vehicles business, the Piaggio Group closed 2011 with a total of 238,300 shipments (+2.1% from 2010) and revenues of 491.1 million euro. This result was substantially in line with the 2010 figure (a reduction of approximately 1%), but would have shown growth of 4.3% at constant exchange rates. On the Indian three-wheeler market, Piaggio Vehicles Private Limited confirmed its position as the subcontinent’s main player, with a market share of 37.1%. Shipments in India (3- and 4-wheel commercial vehicles) rose by 2.4%, from 219,600 vehicles in 2010 to 225,000 in 2011. 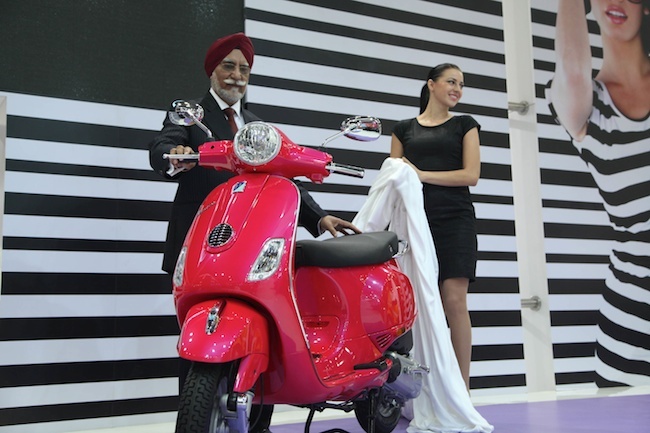 On 6 January 2012 the Vespa scooter developed for the Indian market was presented at the Auto Expo show in Delhi, Asia’s main motor show. Powered by a new low-emission fuel-efficient Piaggio engine with a capacity of up to 60 km/litre, the scooter will be produced in the Piaggio plant in Baramati (India) and begin shipping in April in India’s 35 largest cities. Initial production capacity is 150,000 vehicles/year. The Piaggio Group 2011-2014 Business Plan envisages strong growth in productivity to generate value for customers, employees and shareholders by leveraging the Group’s growing international presence, and boost product cost competitiveness on key processes like procurements, manufacturing, design. In terms of the business and geographical areas, the Plan sets out a growth strategy consistent with the world economic scenario, targeting decisive expansion on the emerging high-growth markets, accompanied by the maintenance and consolidation of the Group’s leadership positions on the mature markets. On the mature Western markets, further consolidation of the Group’s European leadership on the two - wheeler market as a whole and in the scooter sector, and growth in sales and margins for motorcycles thanks to the Aprilia and Moto Guzzi ranges; in commercial vehicles, higher sales and market share in India (in part through the introduction of new 3- and 4-wheel vehicles in the fastest growing market segments) and in the emerging countries, maintenance of current market positions in Europe, and further growth in exports to African, Asian and South American markets. As far as technology is concerned, the Piaggio Group is focusing strongly on the development – for two- wheelers and for commercial vehicles – of new highly innovative combustion engines, with sharply reduced fuel consumption and emissions. Supported by cooperation among the Group R&D centres in Europe and Asia and the world’s leading universities, Piaggio will also continue development work on vehicles equipped with new-generation electric motors, as well as hybrid engines, a field where the Group is already one of the world’s most advanced manufacturers. Consistently with the Group’s increasingly global industrial and commercial organisation, strong emphasis will also be given to development of an international system of expertise and research in product marketing and style, with Group centres in Europe, Asia and the USA bringing together the top designers and marketing specialists from all Piaggio Group locations around the world. The VACC Safe Routes Rally is over for another year. 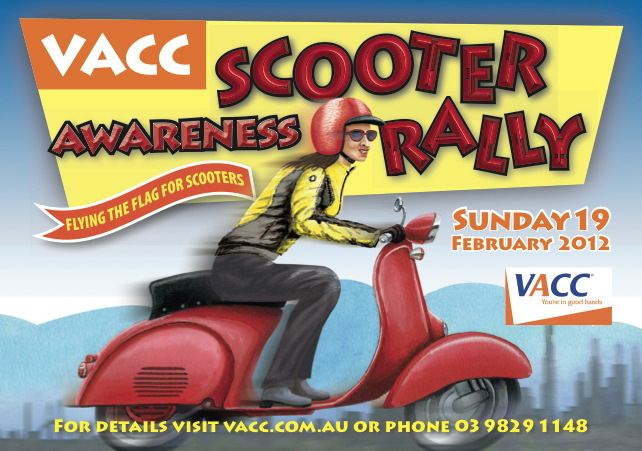 The Sunday run attracted a sea of scooterists, all of them focused on raising the awareness. See more about the meaning of Safe Routes by downloading the rally flyer below. Keep a handle on what happened on the day by visiting the VACC Safe Routes Rally Facebook Page. A few attendees have also been contributing some great photo collages of the days ride. Check out the latest updates by clicking here…..
Having also scanned the web I've found some other fantastic images from the day itself. 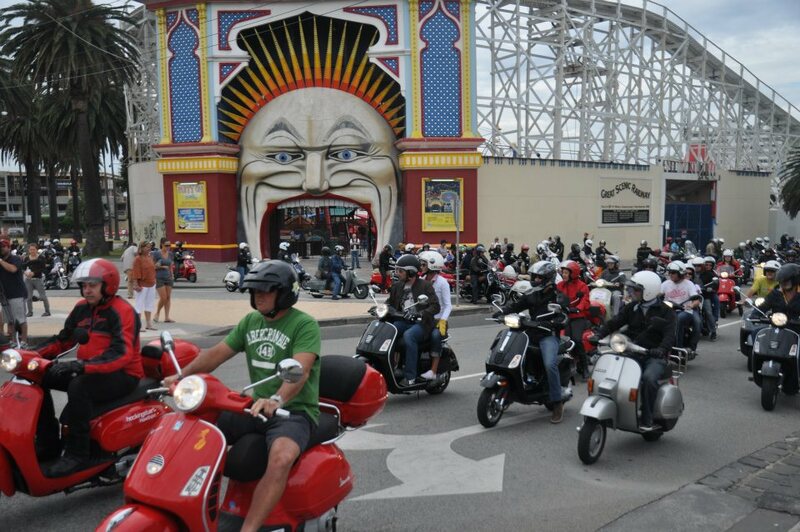 Take a look at the images posted on the Vespa Club of Melbourne's Facebook Page. Congratulations to all who attended. A great cause that attracts its fair share of media attention. It all helps. 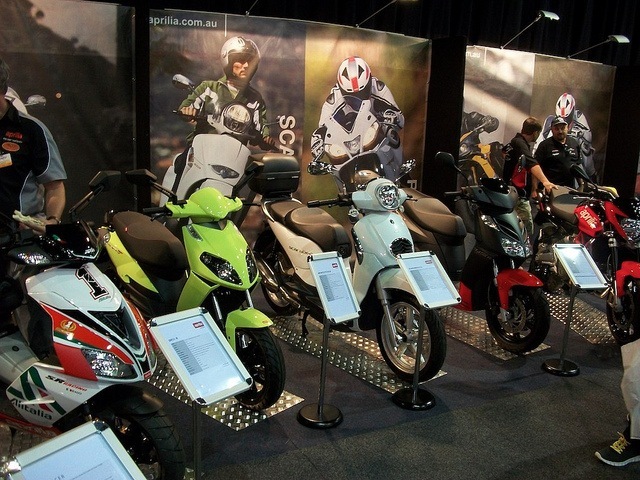 Motorcycle, Scooter and PWC fans converged on the Gold Coast last weekend for the annual Motorcycle and Scooter Expo. Scooters played a role with most of the show regulars taking part in the event. 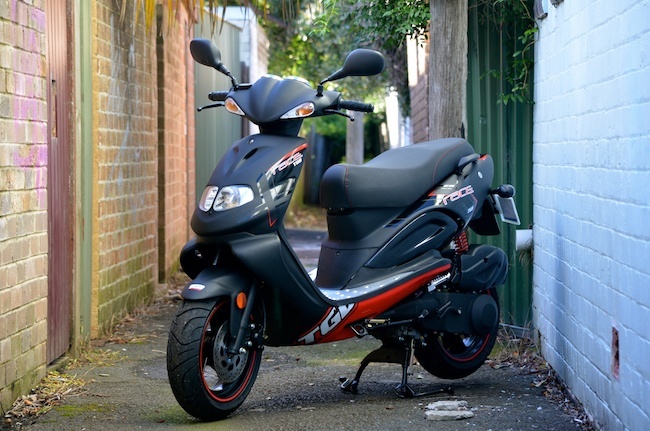 With Queensland being a "Ride On A Car Licence" state, 50 cc scooters are very much the market catalyst here. The trend is slowly moving towards people recognising the benefits of larger capacity scooters. Though what's not to love about a 50, cheap, fun and easy to manage. First up the Golden Bee. 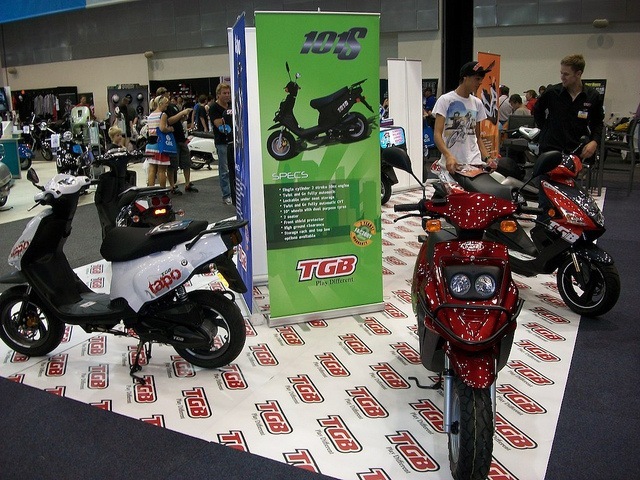 TGB has a host of 50 cc scooters, the Tapo being the big mover here. The TGB stand looked smart and was filled with updates of the Tapo, the Bullet and the new X Race 150 also made an appearance. Actually TGB keeps coming out with some really smart colour schemes. Timing was not on our side so we didn't see the new Bellavita due out in April this year. Aprilia focused on the core scooter range. The Sportcity - Sportcity One - SR50 fitting right in with the bigger superbikes on display. The new Scarabeo 200 was on display for the first time at a show and it looked classy sitting between the Sportsters. I was hoping we would see the new Aprilia SRMAX 300 on display though it didn't make the journey in-time from Italy. We hope to see that one shortly. Honda had the new Dio 100 on display, this scooter has now been on sale for a while now in AUS. 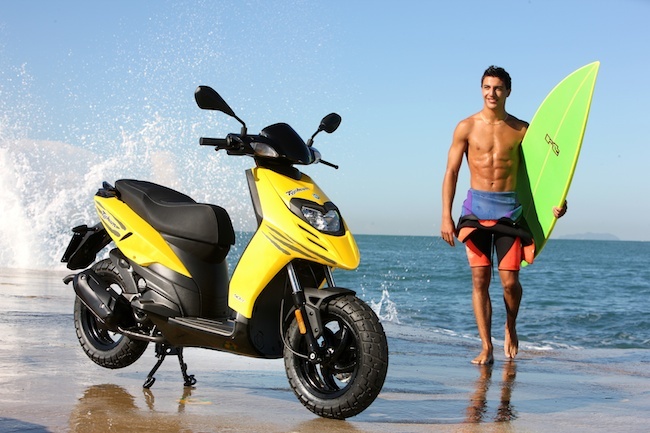 The PCX and DIO will do the hard yards for Honda in 2012. The Integra, Honda's new Maxi/Hybrid motorcycle should also make it out shortly. For Yamaha, the T-Max still looks the goods dressed in black. Still no 2012 T-Max to be seen though. Other scooters on the stand included the BWS and Vity. The Majesty 400 should not be forgotten, still a great scooter. PGO had the smart-looking little retro Ligero's on display. Motorsport Importers also featured the Zues helmet range. And not forgetting the GMAX 220i. Adam from the Scooter Shop showcased his own stand featuring performance parts. Walls full of pipes and variators. After winning the recent 24 Hour Leminz scooter race Adam knows how to hot-up a 50. 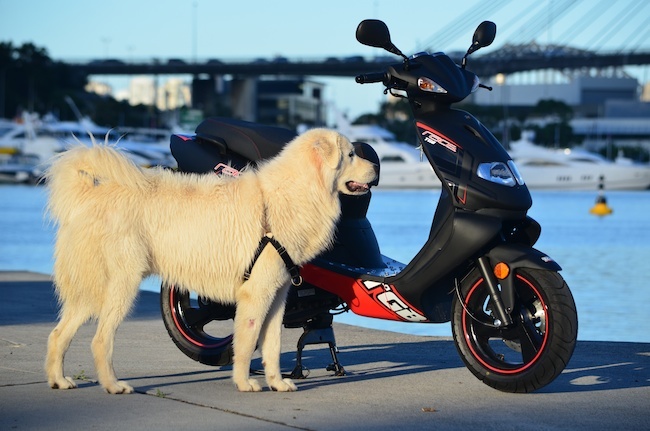 Piaggio/Vespa had a few models seen for the first time in Queensland. The 50 cc version of the Piaggio Typhoon made an appearance. The fresh faced Liberty 150 also stepped up for the weekend. As we were not able to make the show we must thank Adam from the Scooter Shop Gold Coast for providing the photos of the event. 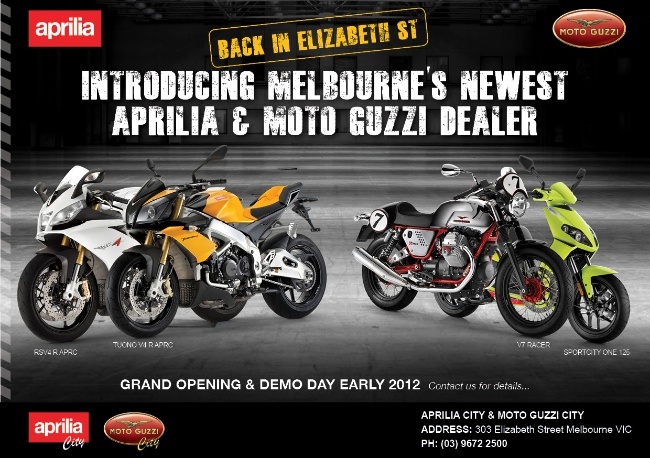 John Sample Automotive, Australian importers of Aprilia & Moto Guzzi motorcycles and scooters are pleased to announce the appointment of a new dealer in the heart of Melbourne’s motorcycle retail precinct on Elizabeth St. Aprilia City and Moto Guzzi City have recently renovated their showroom to present the full range of motorcycles and scooters from two of the fastest growing brands in 2011. The new dealership is already open for business and they are holding the official opening and demo day on Saturday March 3. The family run company, Yamaha City has been in the industry since 1967 and during this time has experienced great success building their business to be Victoria’s Number one Yamaha Dealer for the last 15 years. Kris Matich, General Manager for John Sample Automotive said “This is a very exciting time for our brands and we a pleased to welcome on board Aprilia and Moto Guzzi City who have proven experience and dedication on both the sales and technical sides of the business. We couldn’t ask for a better partnership to represent our brands”. General Manager Dave Buzza said “We have an outstanding opportunity to represent the Moto Guzzi and Aprilia brands and feel that these two iconic products need to be represented here in Melbourne’s Motorcycle district on Elizabeth St. We have made a firm commitment to the John Sample Group and the ever growing Moto Guzzi and Aprilia customer base to provide a sterling level of service from all arms of our dealership”. It's been quite a while since the Ace Scooters blog made its last foray into publication, because whilst I enjoy putting pen to paper (or keyboard to screen) to talk about what is happening in "scooter world", without a target date or publication, it always gets pushed to the back of the to do list. So when Adrian at Scootersales asked me to revive our commentary, I said that I'd do so on one condition - that he reminded and cajoled me to get it done. Well it seems to have worked so far! So 2012 is well and truly upon us, and early indications are that it's going to be a big year for scooters. The positive market sentiment in our industry at least in the last six months of 2011 took a lot of dealers and suppliers by surprise, and for us here at Ace Scooters 2012 has so far been a year of feast and famine. As we anticipated the arrival of the Typhoon 50 has been huge. 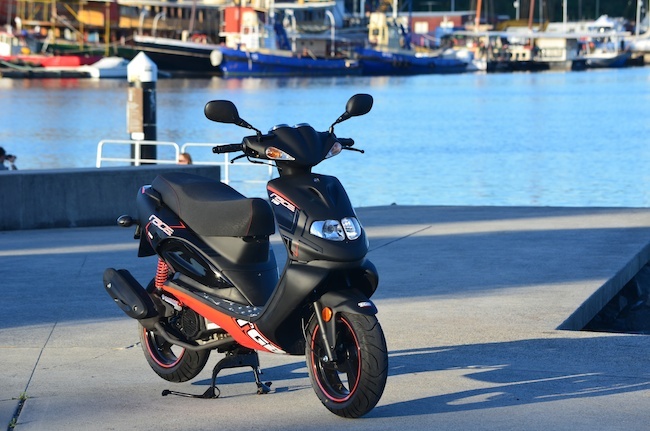 It instantly became our top selling scooter in January, and despite turning up halfway through the month it matched the sales in WA of the very well established Piaggio Zip. Unfortunately the success caught our suppliers somewhat off-guard too, and we've already run out of stock and won't be getting more till April/May! We are starting to see similar stories for other scooters too! The last X7 300 Evo shipment came in November, and instantly sold out! No more till April. The Vespa GTS 250ie started to move in quantities and suddenly warehouse stocks that should have lasted till May... all gone. Fortunately our other big sellers, the Piaggio Zip 50, the Fly 150, and the other Vespa sizes are now back in good supply so at least we've got something to sell! Fingers are crossed that there will be enough till the cavalry arrives in autumn! The message to take home is clear - if you are in the market for a Piaggio or Vespa scooter, and want it in the next few weeks/months, don't hang around, or be prepared for disappointment. They are selling like hotcakes. A very clear market structuring seems to be occurring here in WA with regards to brands. Sales of the cheap and cheerful locally imported "brands" continue apace, as do sales of the more established scooter brands, with the mid-priced and "bike" brands losing market share. There is of course a constant churn of the cheap brands as the market becomes increasingly aware of their associated problems, and sales move toward the next "big thing" till they too drop off. These brands appeal to the dealers (often bike dealers) who seem more product rather than customer focussed, often making a bigger buck on the deal (despite the lower price), but with little chance of repeat business. 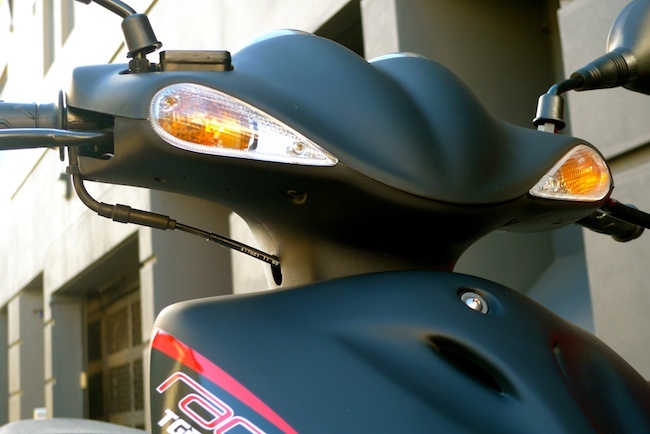 The longer established scooter dealers have generally recognised that happy customers start with good product, and have dropped both the cheap but also many of the mid-price brands too whose sales are suffering accordingly. Next month we will be attending the Piaggio/Vespa National Dealer Meeting where we'll get a chance to talk to the MD of Piaggio Asia Pacific. How much of that info we'll be able to share will be interesting, but we are looking forward to seeing the plans for the medium to longer term and what new models we can expect to see. If last year's EICMA is anything to go by, we are in for some exciting new models soon. The thing with scooters is that as a market matures so does the value equation. In Australia today the value has significantly increased and only seems to be getting better as manufacturers offer more bang for the buck. I'm sure the strong Australian dollar is also helping drive prices down. I'll start with a short story. When I lived in dealerland some years ago I tended to fill gaps with differing styles. You had retro models, big wheeled models and sporty looking commuters. Each had a differing appeal. The TGB 303RS 150 was one of those scooters you could sell with confidence. A tried and trusted model that retailed for around 4K on the road. The TGB 303 RS satisfied those looking for a solid sporty commuter. Fast forward a few years and the X-Race 150 enters the market at a grand less and not much has changed. The TGB X Race is pretty much the same scooter with a few years tacked on for good measure. Though I must admit the latest incarnation with the matt black and red colour scheme looks the goods. The red wheel stripes and belly pan stand out a mile, it comes with a new found flair. The X-Race is fitted with the same grunty 150 cc engine. It's punchy, moving the X Race towards the ton without a fuss. It accelerates away from standstill briskly and the engine and transmission seem like a perfect match. Enough punch and pulling power to double if required and enough room to do so in a comfortable fashion. The X Race also features twin adjustable shocks on the rear. Instrumentation is as basic as they come. Two large round dials, speed, fuel and a set of warning lights. Switches feel good on the fingers, lights high and low beam, blinkers and a kill switch. The only thing missing here is a digital clock. Storage is not forgotten with a relatively flat floor that combines with a large underseat storage bucket (full-face helmet territory). 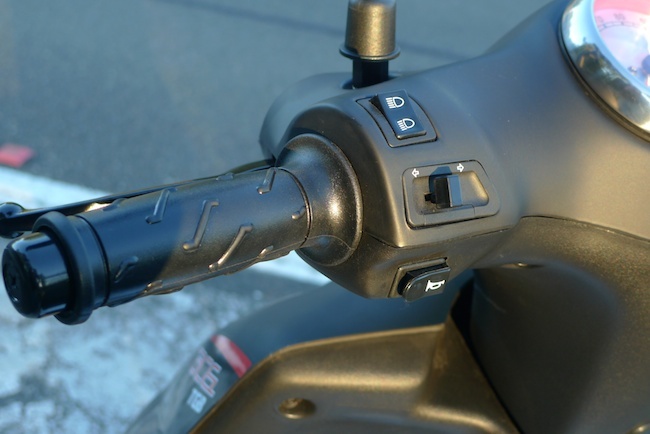 You'll find two small hooks under the seat to lock your helmets externally if required. 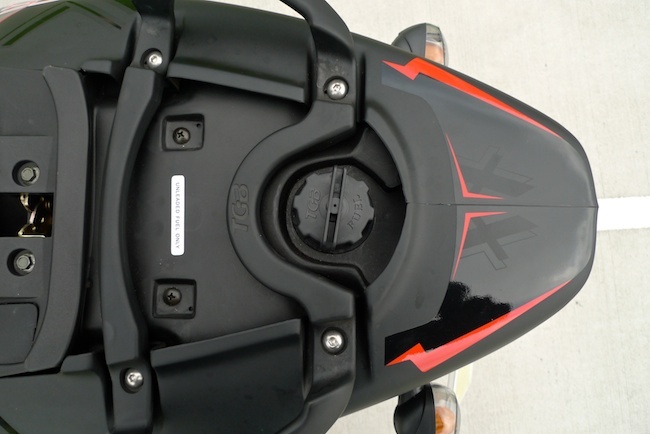 The fuel filler is located under the seat also. Starting to sound like a few basics have been covered doesn't it? Brakes are disc on the front, drum on the rear. Mirrors are durable plastic jobbies. A side and centre stand combine for parking duties. I found this model on the road surprisingly competent. Why so surprising? At this price point you don't have high expectations, especially for this capacity. You think somewhere along the line a shortcuts been taken or a component or two has been downgraded. With the X Race 150 I can confirm this isn't the case. The TGB X Race felt every bit as good as the scooter I remember, better even. A significant well sorted scooter. You feel the impact of 13 inch wheels whilst the twin-shock rear keeps things settled. You can poor on the power and push the X Race into corners without fear of it jumping around or losing balance mid-turn. The X Race is far from heavy and feels agile when under pressure. Hills had little effect on the X Race, and being a 150 you'll have more than enough grunt for light motorway work. I remember Scooterman getting back from taking a few pictures. I was yet to ride the X Race and had pretty much shrugged it off as a cheaper budget option. On return he showed an honest surprise by the quality and ability of the X Race. Here is a scooter he said that would form the basis of a fun, easy to manage commuter. Quick summary : Handles well, filters easily, light and punchy. After this I hopped on and formed my own opinion. The X Race is very much that. An honest scooter that features twin rear shocks, a grunty 150 cc engine, 13 inch wheels with good rubber. For around 3 grand ride away, I've had to reassess my expectations. You sit high on the X Race, you feel committed, you feel like riding the socks of it. Brakes are fair, the front disc is the one to use here and does the job well. The rear drum is just for steadying and standing still at idle. The X Race is mainly for those sports fans among us, the style dictates this. Though regardless of your tastes I'd be giving it a crack. You'll be surprised just how competent this scooter is as a daily commuter. The X Race is not a long distance tourer, though there is no getting that impression. The X Race is just a well sorted inner city scooter. We are seeing more of this on today's market. A bunch of well sorted scooters that make great sense dollar-wise. Not forgetting the X Race is also Taiwanese built. The X Race won't suit everyone, it might be a little "loud" for some. Though don't throw it aside, because as far as commuters go this one should feature right in the mix. Match it up with scooters in higher price brackets, it compares well.